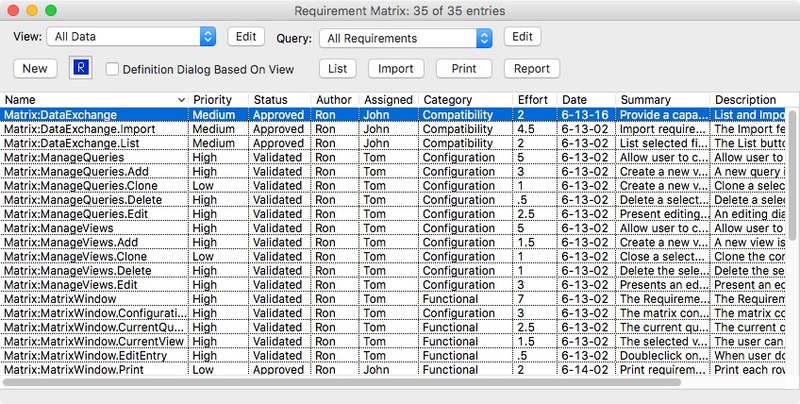 Conceptually the Requirements window can be thought of as a list of named requirement statements or use case entries. The left side of the window shows an alphabetical list of all entry names. The right side of the window shows detailed information on a particular entry. Use Case descriptions are used in the UML notation for object-oriented design. In addition to explicitly identifying and specifying requirements, the Requirement window provides a designer with flexible traceability between requirements and associated diagrams, tables, text or code documents. Each requirement can be mapped to one or more documents, specific diagrams within a document or even to specific diagram objects. The user simply double-clicks a requirement reference to see that item. Likewise, a designer can instantly show all requirements related to a specific document, diagram, table or selected diagram object or table cell. The simple concept of a named list of requirement or use case entries can be substantially enhanced by grouping related requirement entries and providing a structure to the information collected for each entry. A user-defined definition template can be assigned to requirement entries. 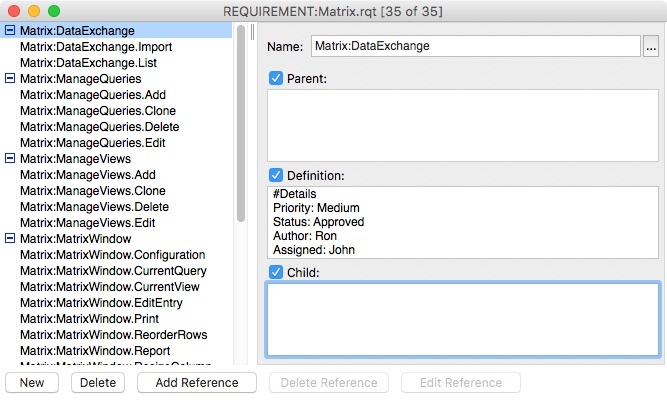 The Requirement Matrix presents this information in a spreadsheet-like interface using custom views and queries.